How many times have you wished you could exercise your dog without pounding the pavement on yet another trudge past the same old light poles? Teach your dog to retrieve and you have instant, interactive playtime. My bully mix, Mac, has exactly zero retrieving genes in his short and stout body, but I used his love of treats to build this skill starting with baby steps. To build Mac’s desire to retrieve, I had to build his desire to hold something in the mouth. My toolkit: Clicker, delicious meaty or cheesy treats , (I use bacon for slavish devotion) retrieving dumbbell and a chair and end table. Keep your treats on the end table where you can reach them. Step 1-I sat facing my mellow Mac and held out the training dumbbell about 12 inches from his nose. He sniffed it delicately and I instantly clicked and treated him. Step 2, 3 and 4- I repeated the above until my dog was wide awake and actively seeking the dumbbell. Sometimes he would skip this step and just stare at the table where the treats lived, but if I ignored this, he’d touch the dumbbell again. Yes! Step 5- Now that Mac was reliably reaching for the dumbbell, I waited for a little more intense interaction before producing the treat. He stamped his feet and huffed a little in frustration, and then put his mouth around the dumbbell. Click and insta-treat! Step 6- Here comes the hard part. 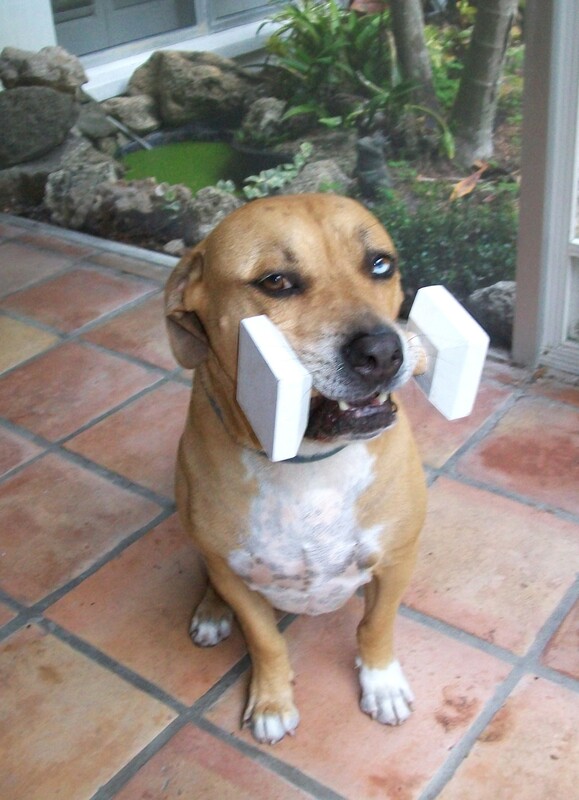 I had to motivate Mac to hold the dumbbell until I clicked. As he placed his mouth around the dumbbell again, I rolled the dumbbell in, gently lifted his chin a bit and lightly petted him there, saying “Hold it”. After two or three seconds, I clicked and treated him a few extra pieces. Mac is no retriever, but he can fake it until he makes it! This entry was posted in dog love, dog manners, dog school, dog training, dog tricks, loyal dog and tagged A Dog's Life, bully breeds, cute dog, dog training tips, pet rescue, pit bull love, pit bull retrieves. Bookmark the permalink. What a great story about the road to retrieving!